Even As MERS Epidemic Grows, The Source Eludes Scientists : Shots - Health News Since emerging last year in the Middle East, a mysterious virus has infected at least 132 people and killed 58. But it's still unknown how people get infected. A genetic analysis now suggests that animals may have repeatedly infected people with the deadly virus. 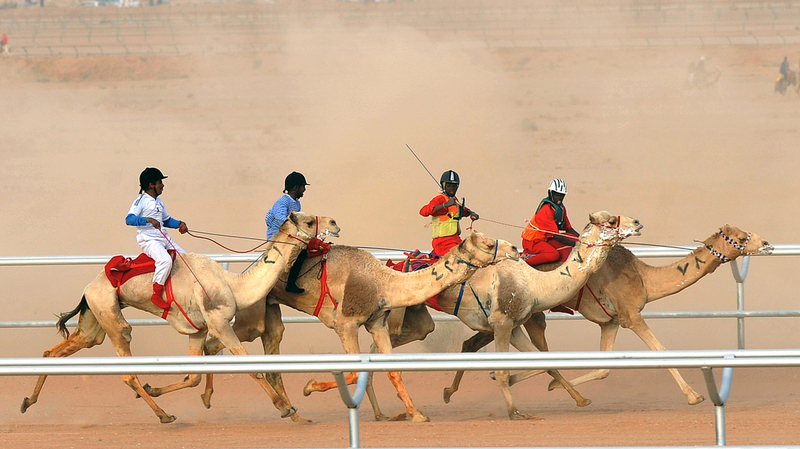 Camel jockeys compete at a festival on the outskirts of Saudi Arabia's capital Riyadh, a focal point for the Middle East respiratory syndrome virus. A year after doctors first identified an illness that came to be known as Middle Eastern Respiratory Syndrome researchers are reporting fresh genetic information about the virus that causes it. The findings don't bring scientists any closer to understanding where MERS is coming from. In fact, the main news is that researchers were wrong about the source of some infections in the largest cluster of cases so far. That would be in the province of Al-Hasa in eastern Saudi Arabia, the country where most of the world's 132 MERS cases and 58 deaths have occurred. The Al-Hasa outbreak was concentrated in several hospitals. Last month, an international team of health workers reported that 21 of the 23 MERS cases in Al-Hasa "were acquired by person-to-person transmission in hemodialysis units, intensive care units or inpatient units in three different health care facilities." But that's not entirely right, scientists said Thursday in The Lancet. A look at the virus's genome indicates that some of those 21 cases weren't hospital-acquired infections after all. When researchers compared the viruses from some patients with those from other patients, who were presumed to be sources of the infection, the viruses' genetic codes were just too different. "When we mapped the cases based on contacts, we were confident we knew the source of transmission," study author Ziad Memish tells Shots. He's the Saudi deputy health minister and the official in charge of the kingdom's response to MERS. The new genetic analysis, Memish says, shows that there were more sources of infection in Al-Hasa than previously thought. "The hypothesis now is [that] there were multiple introductions into the hospitals from the community, which gives us the clue that there is probably a community source of transmission," he says. Those sources could be people with unrecognized mild cases of MERS. They could be animals that transmitted the MERS virus to people who ended up in the hospital. Or both. Memish leans toward animals as the likeliest source. Whatever the source is, it seems to have gone underground for now, eluding the Saudis' continuing surveillance efforts. "There does not seem to be, you know, an ongoing source, since we have not seen any more cases in Al-Hasa since the cluster stopped," Memish says. "My gut feeling is [that] there is some animal reservoir that is causing the transmission that is still to be found," he says. Researchers found three distinctly different types of MERS viruses around the nation's capital, Riyadh. Given the pace at which such coronaviruses evolve, that means a single introduction of the MERS virus from an animal to a human, and then ongoing person-to-person transmission, isn't likely. Wherever the virus came from, it probably was transmitted multiple times. So far the virus hasn't turned up in any of the bats, camels, goats, sheep, dogs, cats or rodents tested. Memish doesn't count a recent report that a small piece of a virus retrieved from a bat was identical to part of the MERS virus from the first reported case. One Dutch team recently found evidence that camels had been infected with MERS or a very similar virus. But it didn't look specifically for the virus itself. "We will continue to try to find the actual virus in an animal so we can confirm it," Memish says. But the animal search is really just beginning. Memish says a team from the United Nations' Food and Agriculture Organization visited Saudi Arabia just this month. "We're waiting for guidance on what animals to sample, what sort of samples, how many of them, from which part of the country," he says. "Hopefully that will give us some results that will take us forward." Some scientists think the effort to find the source of MERS hasn't been nearly urgent enough. "What's really troubling here is that we should have had this kind of information long ago," says Dr. Michael Osterholm of the Center for Infectious Disease Research and Policy at the University of Minnesota. 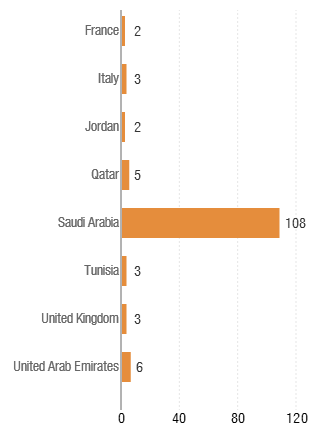 Osterholm points to steady reports of new MERS cases (including 18 more from Saudi Arabia reported Thursday) as evidence that the virus is circulating mainly among humans — contrary to Memish's hypothesis that MERS is coming mainly from repeated animal-to-human infections. "Week after week, month after month, I think the epidemiology suggests unrecognized person-to-person cases," Osterholm tells Shots. He has urged Saudi officials to do studies with people to figure out whether those people who got infected show specific patterns of exposures, like contact with animals or other people with symptoms. "The fact that we have such incomplete information a year into this is just inexcusable," Osterholm says. MERS has a 65 percent mortality rate among known cases. And it could conceivably acquire a few crucial mutations that would allow it to transmit efficiently among humans. That's exactly what SARS, a cousin of MERS, did back in 2003, when it transformed from an animal virus to one that spread easily among people. Memish is sensitive to criticism that Saudi Arabia isn't doing enough to solve the mystery of MERS. "I know the criticism has not stopped from some people, but I can tell you we are working night and day," he says. "It won't be too long before we find out what's going on." This weekend Saudi Arabia is bringing 45 experts from all over the world to try to solve the problem — or at least figure out how to. "We will have an amazing faculty," he says. "If all [those] experts cannot do it, you cannot blame us."